No jokes, no drama, this strip is just... it just is. GGaR has been going on for almost 9 years. Naturally, this means it has grown in parallel to my own life experience. And as many have guessed, my view on alcohol has changed throughout these nine years. Roomie is what's called a binge-drinking type of alcoholic, meaning she doesn't *have* to drink every day or even every week, but when she does drink, she has a hard time stopping. That + her carefree attitude amplified when drinking, leads her into situations like the one told last arc. 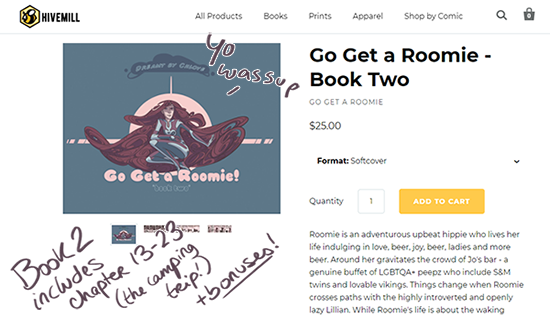 It's a very personal thing, as is GGaR as a whole, really, and it might not speak to everyone (as in any stories, we relate to different things), but I want I give this part of Roomie's experience justice. Because I think it's an important character development for her to go through. And for those who *do* relate with last arc, whether it is from Roomie's point of view or Lillian's, I give you all the hugs. GGaR Book 1&2 available online! Speaking of which, I really need to update the store's merchandise with new stuff. What would you like to see? More poster choice? Mugs? Tshirts? Comment below on with any ideas you may have!